When you are watching Laser sailing during the Olympic Games or a World Championship it looks really easy to sail the boat very fast. How can you learn to sail the Laser upwind like the Olympic and World champion? It is good to realize that the Laser is the same for everybody. Every Laser that is sold is exactly the same. 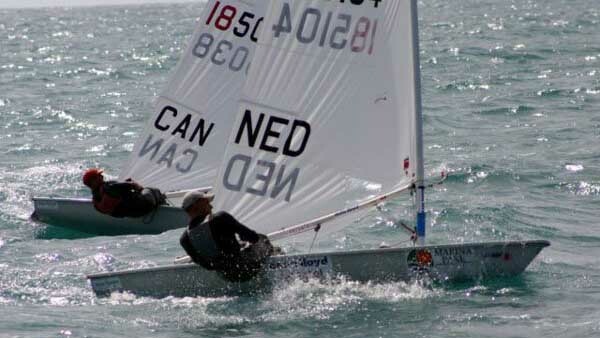 That makes Laser sailing very competitive and gives you the opportunity to sail like the top guys and girls. The secret of upwind sailing is balance. The more your boat is balanced the faster it will go. Just like the champion sailors, you have three tools to control the boat speed. First there is the trim of your sail. It is very important to have your sail set up correctly. Check out the complete trimguide video here. When your sail set up is correct the balance in your Laser should be really good already. Unfortunately, sailing is a very dynamic sport and the circumstances can change really quickly. Every time there is a change in wind speed or wind direction, the balance in your boat will be disturbed. Every time you hit a small or bigger wave, the balance in your Laser is disturbed. To sail the boat nicely balanced, you need to counteract every movement the boat is making! The second tool for sailing your Laser balanced is your rudder. You can use the rudder to counteract the disturbing variables like wind and water. When the wind direction changes slightly, use the rudder to change course so the pressure in the sail remains the same and with that your boat remains balanced. Also, when you hit a wave you can use the rudder to balance the boat. The third and final option to balance the boat is your bodyweight. Try to use your bodyweight to counteract all the disturbing moments of your Laser. When the nose of the boat wants to come up because of a wave: move forward. As soon as the wave has passed and the boat wants to go down again: move backwards. This way you minimize the disturbing in your Laser and maximize the balance in the boat. The better your Laser is balanced, the faster you will go. Can I really sail my Laser as fast as the world champion? The top Laser sailors in the world are aiming for the same goal in their technique when sailing upwind. But they have learned to execute this technique perfectly. They are really proactive in counteracting all the little disturbing variables. Therefore their adjustments are smaller, the balance is better, and the boat will go faster. However, if you really want to, you can learn to sail the boat as balanced as the top guys. Check out the video for more information. Visualization works! Good luck. SportVid is founded by Roelof Bouwmeester and Sietse-Jan Sietzema. Both have many years of experience as sailors at the highest level, coaching talented youth sailors and Olympic athletes, such as Roelof’s sister, Marit Bouwmeester, 2016 Olympic gold medalist in Rio!